This is the first time that Goodspeed Musicals in East Haddam, CT has produced the show, which relies heavily on great character actors and gifted children. With outstanding direction by Rob Ruggiero and choreography by James Gray, this cast, under the guidance of those two talented innovators, has risen to the challenge of telling the story of a gang of thieving children and their leader, the loveable villain Fagin, who snatches runaway orphan boys, and makes them expert pickpockets. Starving in the workhouse, the orphans complain with the opening song “Food, Glorious Food” which begins with a drudging lament, but quickly becomes a joyfully hopeful tune as they imagine their future filled with tables of tasty treats. 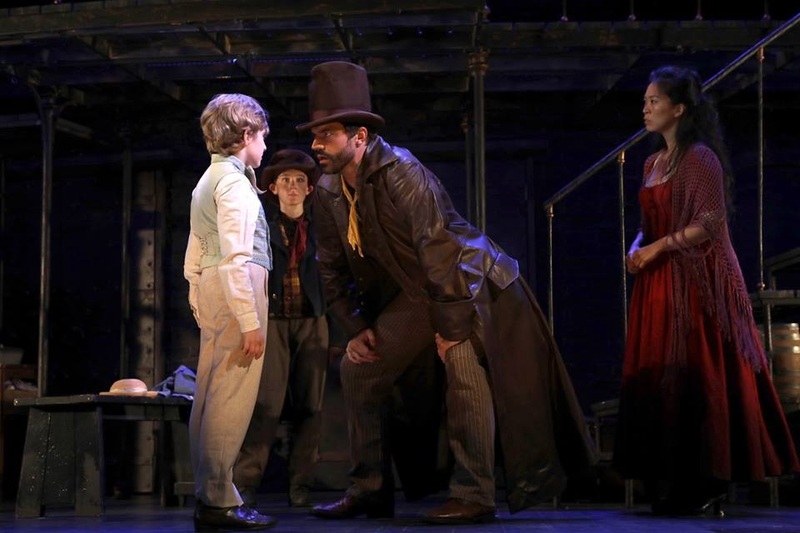 Escaping the undertaker’s clutches, Oliver meets Fagin’s sidekick, The Artful Dodger, who invites the boy back to the gang’s hideout and tells him to “Consider Yourself” one of the family. 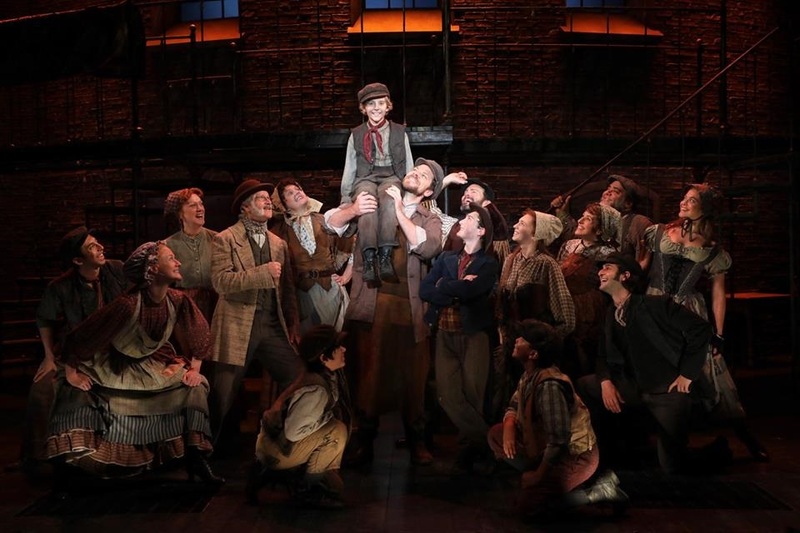 Gavin Swartz* as the Dodger is bouncy and cheerful and “Consider Yourself” becomes one of the many uplifting and melodic songs in the show. 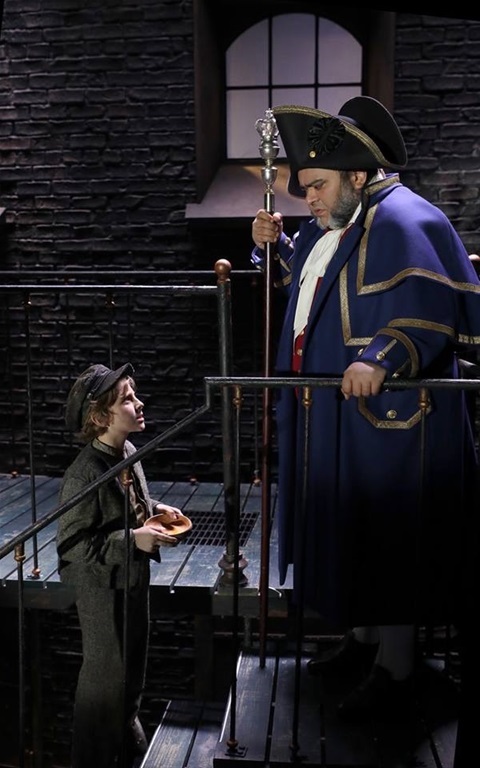 The outstanding actor in the show is Donald Corren* as the self-described retired thief Fagin, who is using the boys to raise money for his inevitable retirement. Instructing them in the fine art of crime “You’ve Got To Pick A Pocket Or Two”, Fagin sends them on to the streets but instructs them to “Be Back Soon.” With each tune, Mr. Corren never shows himself, but only reveals more and more of Fagin. 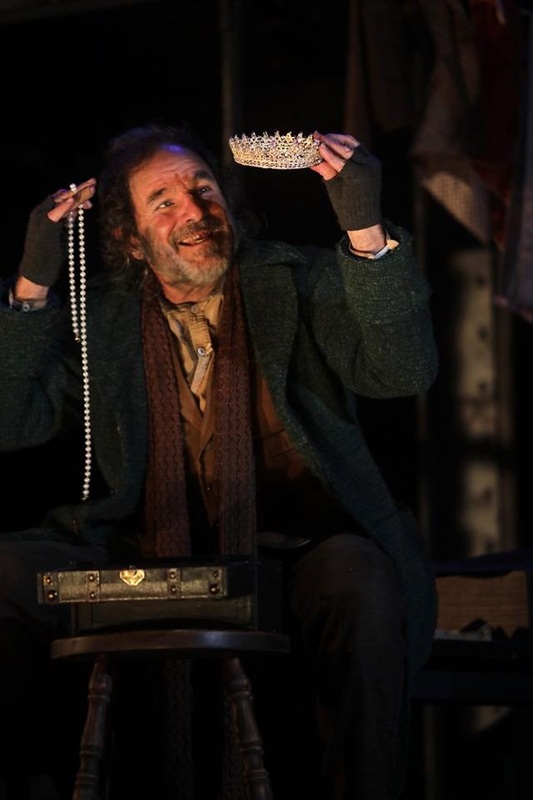 At the delightful finale, “Reviewing The Situation” there is only Fagin on the stage – no actor- just the Dickens character come completely to life. 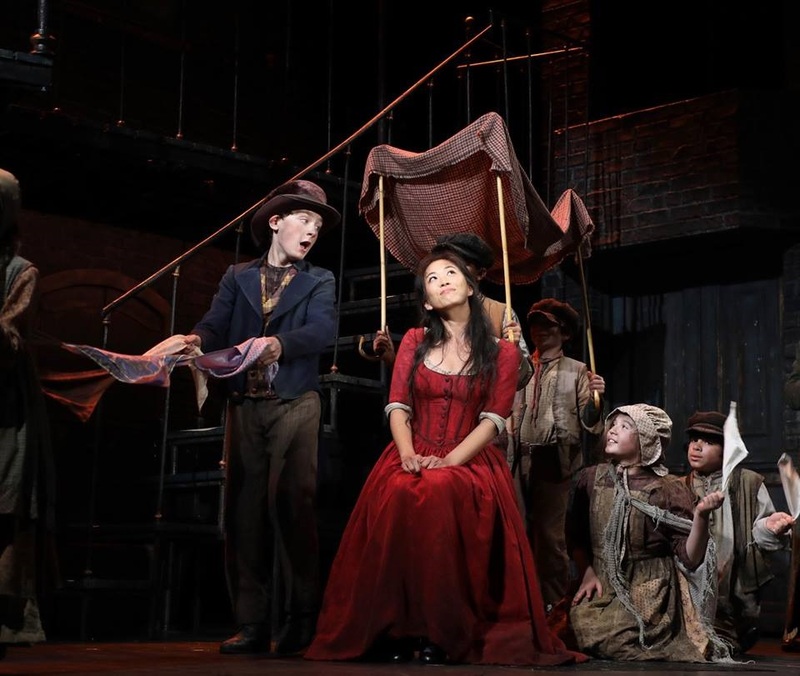 Another of Fagin’s protégés is Nancy, a young woman who acknowledges that her life on the streets is awful. She refuses to give in to despair by singing a rousing anthem “It’s A Fine Life.” EJ Zimmerman* plays Nancy with a mild street-wise bawdiness which is enhanced by a lovely femininity. She’s equally at home onstage tearing up the local tavern with her raucous “Oom-Pah-Pah” act and later tearing at our heartstrings with another show-stopper “As Long As He Needs Me.” That song, a true indictment of domestic abuse, shows how far the world-wide women’s movement has progressed, and how far it still has got to go. 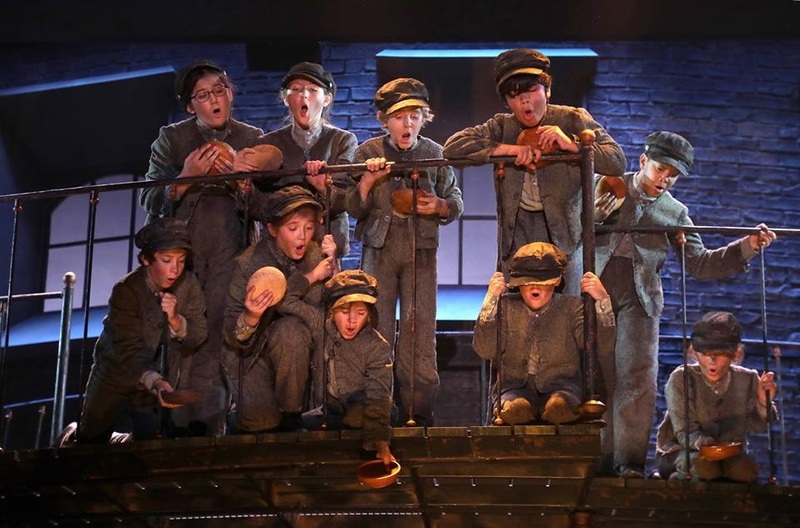 The set, a gloomy workhouse expertly designed by Michael Schweikardt looms over the production, constantly reminding us of the desperate plight of the orphans and other destitute street people. There is a glimpse of unbridled joy in the streets as the tradespeople, selling strawberries, milk and roses, burst into song with a bustling “Who Will Buy?” By this point in the story, Oliver has been given a home, and the song also reflects his joy in being taken care of by good people. The cheerful lyric, “Who will buy this wonderful feeling, I’m so high I swear I could fly” describes Oliver’s mood perfectly. In counterpoint to Oliver’s new-found happiness, Brandon Andrus* plays the sinister villain, Bill Sykes, as especially menacing and unredeemable. Nothing good ever happens when Bill is wandering through London. Mr. Andrus’s playbill bio encourages a round of “boos” - and at the curtain call, some theatergoers enthusiastically gave him what he asked for. The principals, ensemble and kids who make up this energetic cast are superb professionals, and all deserve accolades. Dancers Owen Tabaka as Charley Bates, and Alex Stewart* in the ensemble, give especially noteworthy eye-catching performances. The combined talents of Music Director Michael O’Flaherty and Sound Designer Jay Hilton enhance every lyric, every note in every song. OLIVER! is a delight to hear, a feast for the aural senses. Alejo Vietti’s costumes are perfectly designed – from the filthy rags of the street kids to the fine clothes of the upper-crust and the over-the-top uniform of Mr. Bumble. Mark Adam Rampmeyer has kept his wig and hair design simple – the street people seldom combed their hair during Dicken’s time- and the general populous had unfussy style. Nancy, Bill and Fagin appear to have done their own locks with a toothless comb. Summing up: Here’s a musical, a big hit - about birth, death, child abuse, slavery, prostitution, thievery, class and gender inequality, domestic abuse, brutality and murder. Filled with lustrous music and lyrics that perfectly help to move along the plot, OLIVER! deserves its award-wining status. In the end, despite some disturbing themes, you’ll leave the theater humming: “Consider Yourself” one of the Goodspeed family. Lionel Bart’s OLIVER! at The Goodspeed, 6 Main Street, East Haddam, CT.